Two kinds of rum add depth to this icy coffee cocktail. The flavor is somewhere between coffee ice cream and a Black Russian... So refreshing to sip while watching the summer stars come out. This recipe is meant for readers over 21. Drink responsibly. Place the ground espresso and cinnamon on another saucer - mix well. Dip the rims of the glasses into the sweetened condensed milk then roll in the ground espresso beans. 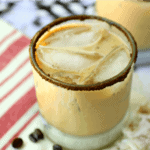 Combine the espresso, both rums, remaining sweetened condensed milk, and the coffee ice cubes in a shaker. Make this a Brazillian Coffee Mocktail by leaving out the rum and adding espresso in its place. Top with whipped cream and espresso dust.